Third Sunday after Easter, April 14, 2013: Gospel: St. John, Chapter 21, verses 1 and following. Jesus Christ doesn’t do Small! He didn’t do Small at Cana, when his first ‘sign’ produced 120-150 gallons of the best wine,- between 600 and 900 bottles! Nor did he do Small when he fed the crowd in the desert,- 5000, and that was just counting the men! A modern fisherman on the lake of Galilee. caught one hundred and fifty three Big fish, all at once. And the net didn’t burst, though it took all their might to haul it behind the boat to the shore. 153 big fish! What any fisherman or woman would give to catch so many. And then, what happened? The fisherman, Simon Peter, left them all behind him, to follow the Master, the one they called ‘The Lord’. ‘It is the Lord’, John cried, and Simon Peter went overboard for Jesus when he heard it and saw the Master on the shore. The fisherman, on the very day he got his greatest catch ever as a professional fisherman, realized it wasn’t his work at all that had done it, but the Lord’s. And Simon then took up a new job from that day onwards,- ‘Feed my lambs! Feed my sheep!’ The professional fisherman became a Shepherd. Pope John 23rd wrote to the bishops of the world before they came to Rome for the Council. In his letter, he exhorted them to be good Shepherds,- but reminded them that their people were not sheep! 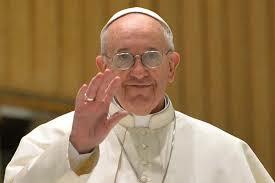 And now, we have Francis, Bishop of Rome, Shepherd of the flock of Christ’s people,- ‘Feed my lambs! Feed my sheep!’,- and we’re not sheep, we are people. But Christ is the true Shepherd of us all. And we remind ourselves today, Jesus Christ doesn’t do Small! And he tells us all, as Church, to ‘throw the net to the other side’,- in other words, to have ears for him and how to do things his way. And he won’t do Small, for his people, his flock, this hungry community, his gathered church in our generation. There are net-fulls and jar-fulls and basket-fulls of blessings from Christ Jesus, at all times and in all places. I’m off! I’m going fishing! 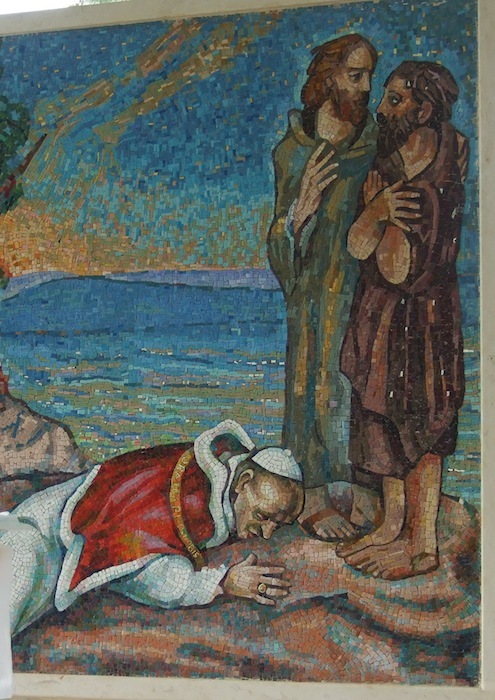 Mosaic: Pope Paul VI kissing the ground at the place by the Lake of Galilee where Simon Peter swam ashore and met the Lord. P.S. If you want the story from the net’s point of view, ‘A NET, BURSTING‘, click here or go to Home Page.